It’s kind of odd that I’ve shown you guys all the “behind closed doors” parts of my master bathroom, like under the sinks, but never done a tour of the actual room. It’s probably because I’ve had an ongoing love-hate relationship with our bathroom. Our first two houses had teeny-tiny master bathrooms, neither with the bathtub I dreamed about. So, four years into living in this house, I’m still pinching myself that the space is ours. At the same time, I’ve been REALLY wishing I had chosen different finishes for the room. That feeling was first amplified when we finished the attached closet, and then REALLY amplified again when we finished the bedroom. It left the bland, beige bathroom sandwiched between two spaces full of our personalities. Changing the tile is totally out of the question budget-wise right now, and I’ve been stuck on paint color decisions. I want to paint the cabinets navy, but don’t have a full vision for the walls, so am holding off doing anything. I realized it was insane that I hadn’t made smaller changes to make the room feel more like us in the meantime. Progress over perfection is my motto in so many things, and I’m realizing how important it is in decorating as well. And what’s my favorite kind of decorating? ORGANIZED decorating! How did it take me so long to see the opportunities in the bathroom to combine function with style? Looking around, I realized everything I changed fit into three main categories that could help you tackle your space. 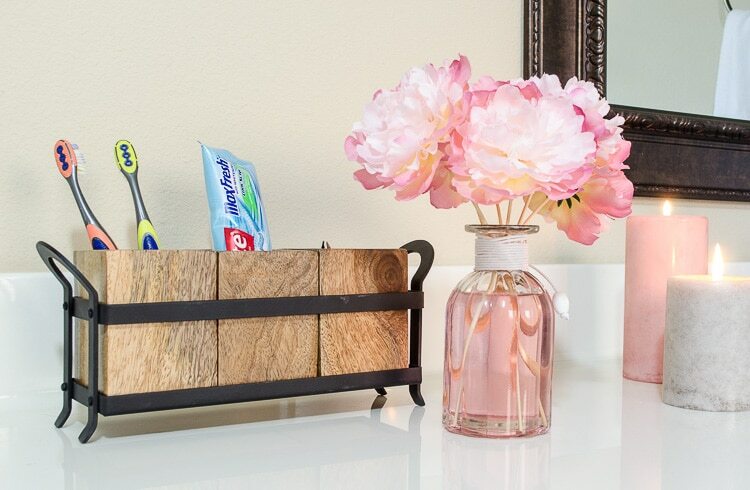 Pier 1 partnered with me for this project, so I added links to everything I used under each photo in case something would work great in your bathroom. 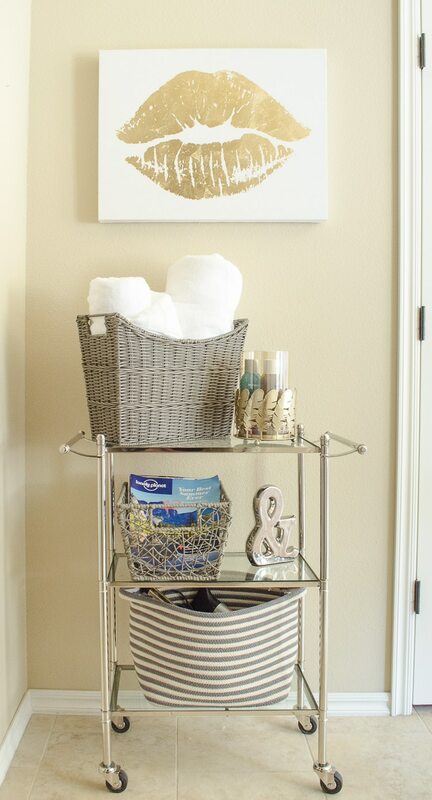 The cart could even be in the bedroom or hallway right outside the bathroom. Why, oh, why didn’t I think of THAT at the last house? We had a totally unused corner that always felt like it needed something. Problem solved! I didn’t really mean to, but I ended up using FOUR items from the kitchen section at Pier 1 to organize the bathroom. They complement the wood cabinets, which makes the cabinet stain seem more stylish and intentional. Even better, I can reuse all three in the kitchen after we do a more major bathroom update. My favorite is the wine rack I used for washcloths on the bathtub. There are no words for how happy I am that I can’t ever get in the bathtub and then realize I forgot the washcloth again. On top of the wine rack, I displayed a monogram mug to help with cleaning. It looks cute sitting there all the time, and now I don’t have to go to the kitchen to get a cup to rinse off the sides of the tub after cleaning. Opposite the wine rack, there was just enough room to fit a pretty storage jar for bath salts. For the vanity, I found a flatware holder that I’m using for toothbrushes, toothpaste, and then scissors and tweezers. And don’t think I won’t dump those items out and “borrow” the holder for utensils at a party! You saw two corners of the bathtub already, but I also needed somewhere to hide away soaps, razors, shaving cream, etc. The pile of loose bottles I had going on before was not so pretty. Now the mess is hidden in my new favorite basket! The addition of containers to the pretty cart I showed you earlier really stretches how much it can hold. 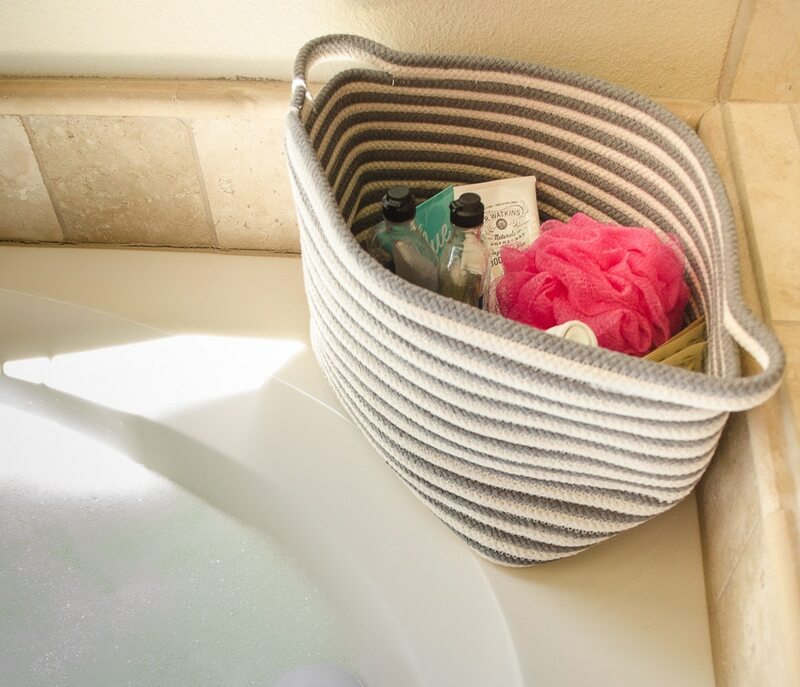 On the bottom shelf, I added a second gray and white striped basket. And guess what’s inside? The blow dryer, flat-iron, and curling iron! Woo hoo!!!!! All three of those items and their long tangled cords used to end up left on the counter almost all the time, even though I only use them every few days. It was just a pain to try and squeeze them into the vanity drawer. Now I grab the basket when I need it, and then can toss everything right back in when I’m done (and they are cooled down). 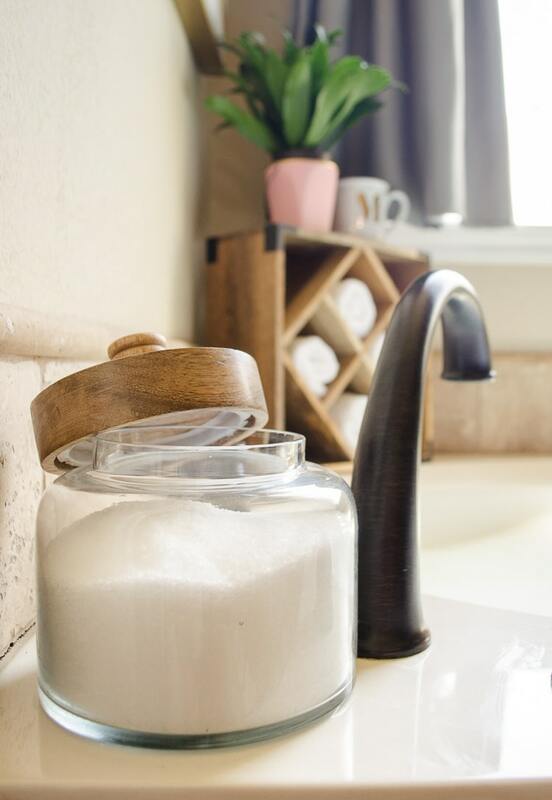 It sounds silly, but that simple idea has been a game changer in keeping the vanity top clean and clear! The second shelf has just enough space for a basket of magazines. Because don’t we all have visions of settling into a bubble bath with a magazine? And wine. 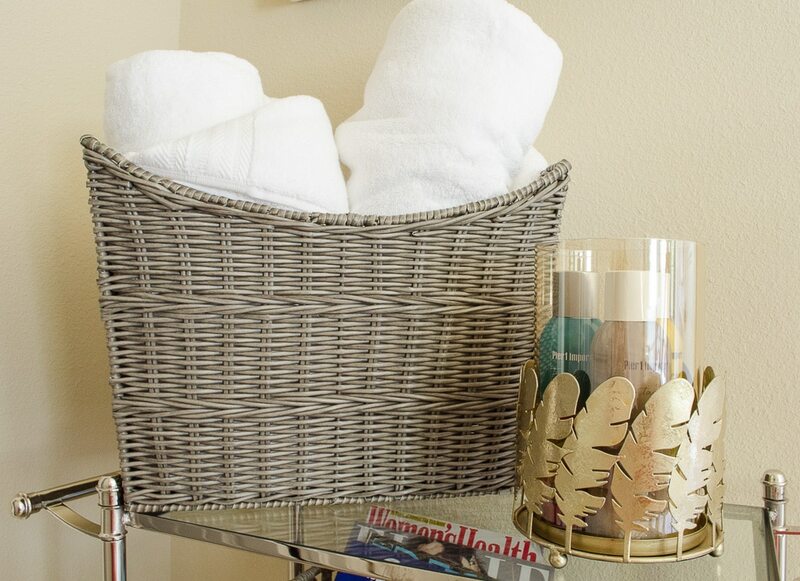 For the top shelf, I used a magazine basket, but rolled up pretty white towels to add a little softness and a spa feel. I also used a candle holder to corral three yummy room sprays. Because smelling great is an important part of any bathroom, right? Even though I’m still ready to ditch the beige walls as soon as I can decide on a plan, I’m feeling a little more zen and patient with the process now. Better yet, the bathroom has been easier to keep tidy. 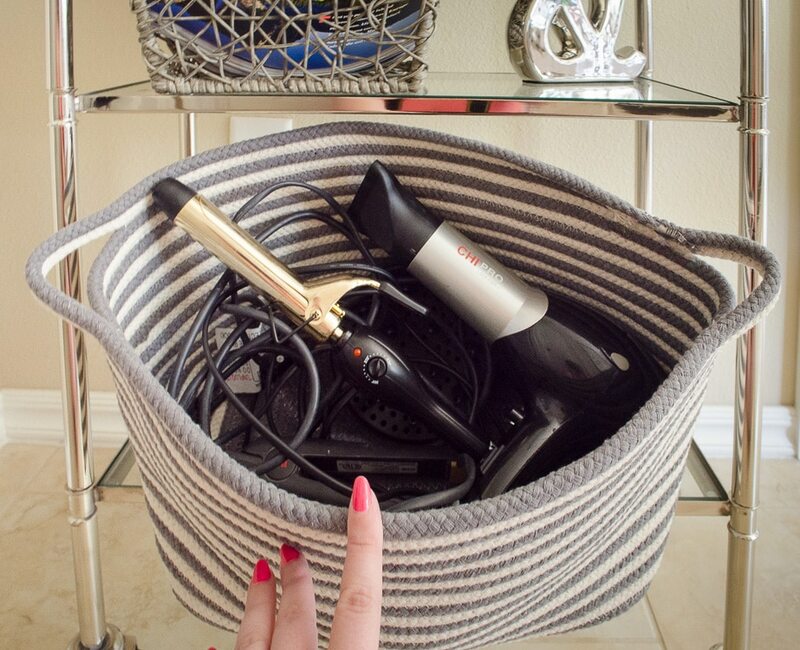 We had solved so many of the clutter issues when I organized under my sink, but the hair tools always lingered. Now EVERYTHING really has a place in the bathroom. It’s glorious! To see more bathroom organizing ideas, check out my bathroom closet, my under sink cabinet, and his under sink cabinet! I like your use of the kitchen items and I think your bathroom looks very pretty and welcoming while at the same time feeling crisp and clean. Sorry it took me so long to respond! The white rug is a brand new product Pier 1 is working on. They’re still working with the source to perfect it. It’s super soft and a gorgeous design, so I can’t wait until they are ready to add them to the stores! Looks really great – so many good ideas. Love the rug – looks plush! Sometimes the smaller things make the biggest impact! Thanks for sharing! Hi! I just stumbled somehow on your wonderful blog & you have my head spinning with all the organizing goodness I could/should be doing to my home. Quick question: Your bathroom cabinets are similar to my own. Have you done a post on what’s inside the drawers in the middle of the cabinets? Hi Debi, So glad you are getting lots of new ideas! I think those four drawers are the last thing I have left to show in the bathroom, but it’s on my list! They need to be reworked because most of them aren’t used, so have things inside that just need to be purged. I used to keep all my makeup in the top drawer, but it has been moved to the closet vanity ( http://www.polishedhabitat.com/2016/smitten-with-this-makeup-organizer/ ). The 2nd drawer still has some used things like deodorant and floss, so those will probably get moved to the top. The 3rd and 4th drawers had hair stuff, and the brushes are still there, but the hair dryer, etc got moved around as you saw in this post. Whew! So that’s the current state, and at some point I’ll figure out what makes sense now and then do a post with the results! How could I adapt your ideas for a tiny bathroom measuring 5′ x 7′? Cindy is one lucky lady!!! It’s so nice to have another person’s input on a problem area. Especially input from someone who is skilled! Are we notified if someone responds to our comment? i wouldn’t even think to come back and check for responses. Hopefully that’s not the case and Cindy has sent you pictures already. This is such a treat! And you know….this is possibly a great idea to do continually. I’d definitely follow a blog that was help and advice for other people’s homes/trouble areas. The blogger responding w ideas, showing pics of things they wd use in the room (You’re the Pier 1 blogger, right???) You could get “graphic” & draw on the picture—to show changes you suggest. I think that wd be a fun blog. I wish I was a blogger! (I’m a nurse of almost 20 years. I have perfected many things, but clueless when it comes to computer stuff, and the tech side of things. Plus I’m not a writer. But I love being creative, sharing my ideas, and helping others. Heck, I dint even know how to make and post my very own pin. I’m assuming I’m allowed to. I just don’t know how! Thank you, Kristen! As long the email address is entered correctly, people should get replies to their comments, which I love! I totally agree that I never think to go back and check. I love your idea, I’ve done it on the blog once before when someone needed help with wire shelves and I should be more proactive with asking for questions to answer. It’s fun for me and helpful for everyone! So, let me know if you have any burning decor or organizing struggles at your house! And thanks for being a nurse, I used to work in the quality improvement department of a hospital and that role convinced me that nursing is the hardest job around! I absolutely get the putting away of the hot hair tools. I am the same way. If I can’t quickly and easily plop it down somewhere, it’ll sit on the counter every day until I get sick of knocking things over and dropping my favorite hot straightening brush! Again. Eek. Like you I also only use my tools every few days. It’s a total hassle to cram them under the sink where they share a tiny spot with the cleaning supplies. Kinda ick! My petite bathroom doesn’t have space for an awesome cart or even a basket on the floor, but you’ve inspired me to tackle this tangled mess. I might be able to hang them on the wall behind the door. –As long as they can’t be smashed. And even then I can put a door stopper up. And then to deal with the noise of the tools clanging around…do I go w padded walls?!?! Lol but hey, what about my padded cork board? I’ll put that on the back burner because I do believe there’s a better and much more stylish way! I’ve gotta take a peek on pier1’s website (I’d be at the store now if it was open! So much great stuff!) and see what other ideas I can come up w. And I’m all for using things in unexpected ways. Way back when I was in my first apt I bought a metal water bottle holder made for a bike to hang my blow dryer. Now you can buy basically the same thing, but specifically for a blow dryer and a bit more money. Being poor sure makes for some serious creativity! Thanks for the great ideas and renewing my motivation for bathroom decluttering. Looking forward to checking out the rest of your blog. Oh yeah, my tangled mess of hot hair tools have all been dropped on the floor more than once – yikes! I love your idea to use the back of your door for their storage. Send pictures if it works! 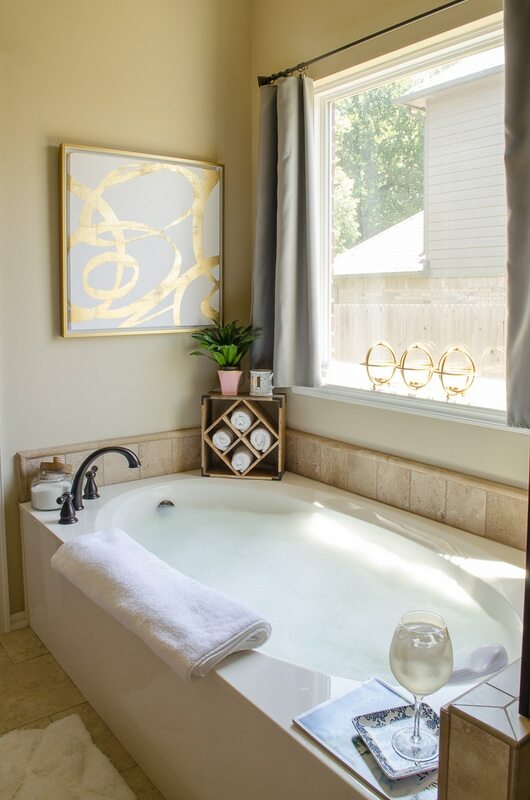 That art work, especially the one over the tub! Where did you get it?! Hi Tiffany, It was a clearance find at Hobby Lobby! I LOVE your bathroom decor soooooooo much that I duplicated the look in my very own bathroom. This look makes my bathroom feel very much like a spa. There are a few things that I changed up to give it my own twist and to save some money. The only thing I have left to do is add a rug and wall art above my tub. Thank you for the great ideas! Yeah! That makes my Monday! 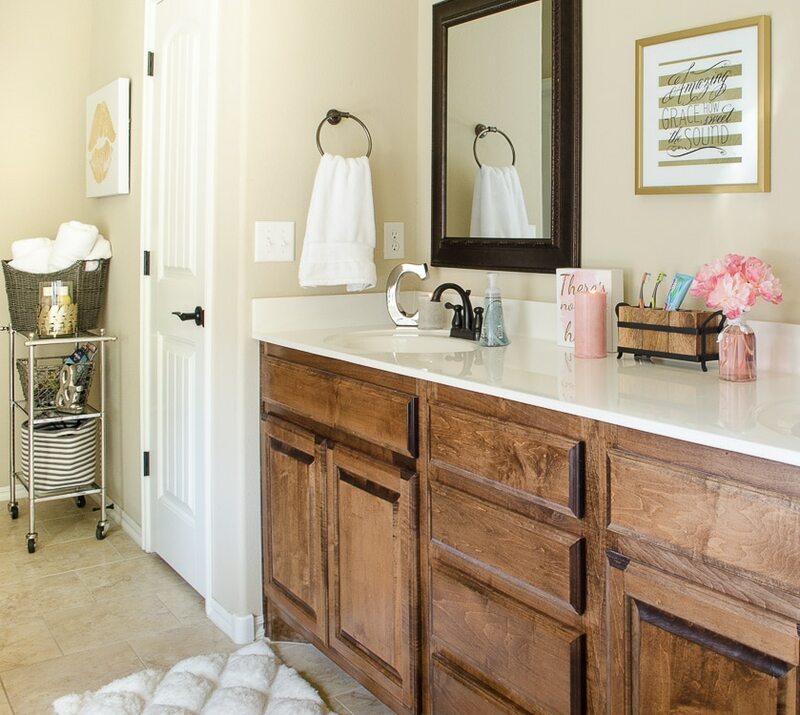 I’m so glad you were inspired to use some of the ideas and get a spa-like feel in your own bathroom! I hope you enjoy it for years to come! Gorgeous storage ideas. The more I organize, the more I discover how helpful it is to have pretty storage. While we can’t always splurge on the beautiful baskets, those end up being the things that help my home to feel less cluttered. Love these ideas! Thank you – I 100% agree!